After playing on transparencies and creating diaphanous marquise gowns last season, Stephane Rolland returned to a sleeker silhouette with a long-limbed line and three-dimensional volumes. The couturier relied mainly on his trusted palette of muted tones of white, caramel, sand, and black, with a few touches of lines and golden metallic effects. Always artistic in his approach, Rolland continued to explore liquid gold, splashing it discreetly on a neck collar or to highlight a waist. 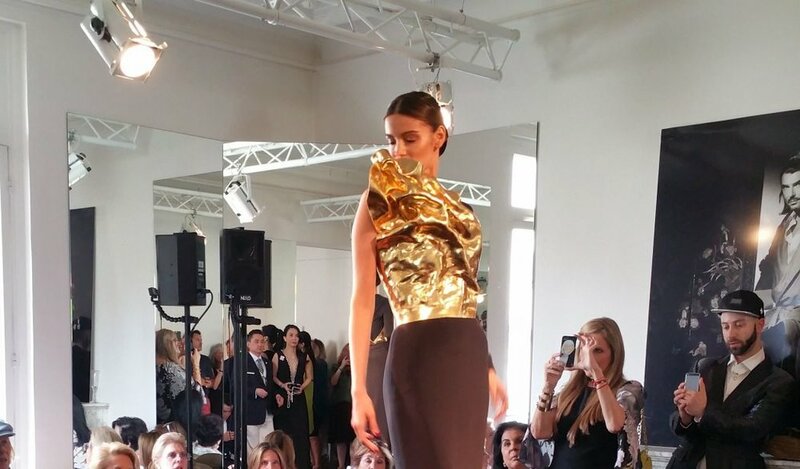 He also created an impressive sculptural bustier made of gold silicone (sculpted like a flame over a long black crepe dress), as well as a large gold shoulder silicone enveloping wave over a sleek white dress with black detailing on its skirt bottom. He used thermo-welded gazar to create enveloping wings over a jumpsuit and voluminous sleeves over a long evening dress. A novelty for the designer this season was a series of waistcoats, skirts, and short capes in white leather or gold lame cut like basketwork and woven. The polished collection was quintessential Rolland with sharp tailoring on fluid crepe and attention to back detailing.